Naranjo, Maria Angelica, Janneke Pieters and Francisco Alpízar. 2017. 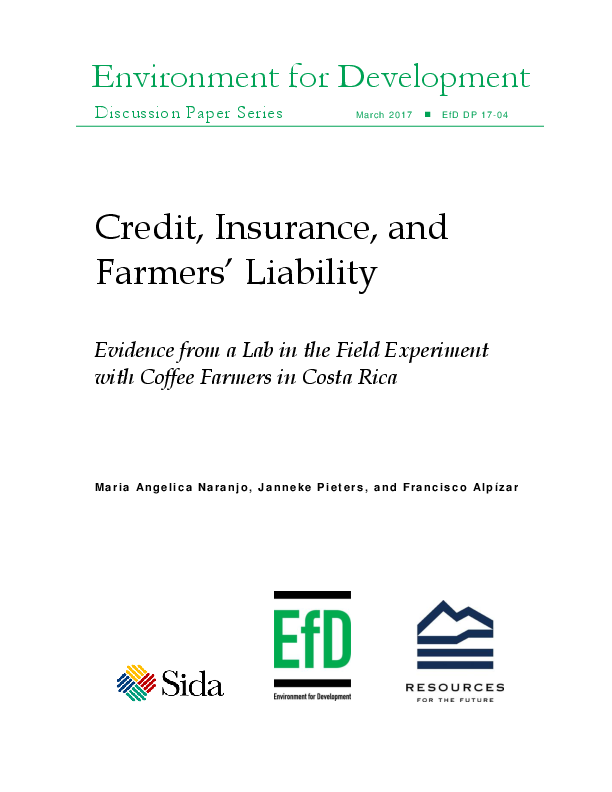 “Credit, Insurance and Farmers’ Liability: Evidence from a Lab in the Field Experiment with Coffee Farmers in Costa Rica.” EfD Discussion Paper Series . To cope with losses from extreme hydro-meteorological events, governments typically implement disaster relief programs and offer debt relief to affected parties. Governments in developing countries have made extensive use of total and partial debt coverage as a way to encourage investment in key sectors and in agriculture in particular. In the context of climate change, such practices are not viable because risk is systemic and losses can easily surpass most governments’ debt relief budgets. Insurance is an obvious alternative, but insurance uptake in developing countries is typically low, and little is known about the interaction between investment, insurance, and debt relief programs, which effectively reduce borrowers’ liability. This paper examines the effect of farmers’ liability on demand for credit with and without insurance. We test predictions of a theoretical model in a lab in the field experiment with coffee farmers in Costa Rica. Farmers choose how much to invest in six different settings, described on the one hand by whether the loan is insured or not, and on the other by the probability that the government provides full debt relief. As expected, uptake of loans with insurance is significantly higher than without insurance when farmers are fully liable, and insurance is not relevant for investments if debt relief is guaranteed. Interestingly, uncertainty about liability is enough to trigger the uptake of insured debt. Our results suggest that well-defined rules for disaster relief are needed to support development of insurance markets.